Let’s get vertical, vertical. Let’s get … well, you get it! Vertical cards are in at MOVO and you don’t have to name that tune to get the first look! The new captivating vertical card concept was designed by Hannah Mills, a member of our own MoPro Customer Experience team. She’s a talented photographer, vocal musician, and a prime example of MOVO’s artistic vibe. “It’s great when people can associate the world of money & finance – things that are so serious – with something lighthearted,” Hannah says. She designed the new card with colorful bands – a fashion staple – but it took someone with Hannah’s talent to make horizontal stripes so flattering! The 24-year-old native of Palm Desert, California joined the MovoCash team in May, and her customer experience role has a greater scope than just helping customers make the most of their money management, she’s also gotten involved with a wide range of discussions within the digital banking company. Hannah’s artistic talent and passion for music comes together in her successful singing endeavors. She writes music, plays guitar and sings at Palm Desert venues, such as resorts and restaurants. She has a single on Spotify and Apple Music, and she toured with popular Christian band Consumed by Fire, performing as their opening act while traveling through 20 cities in 15 states in two months. Many of her gifts are in the visual arts. Hannah is an expert in photography, artistic design and graphics and brings a fresh set of eyes to her projects. She previously did design work for a startup skateboarding company, where she had creative freedom to design boards, T-shirts and hats. It was a partial training ground for the logo design she’s doing at MOVO, such as the new card. The payments industry is dynamic and solutions pop up daily. It can be overwhelming to navigate everyday spending decisions with so many options out there! 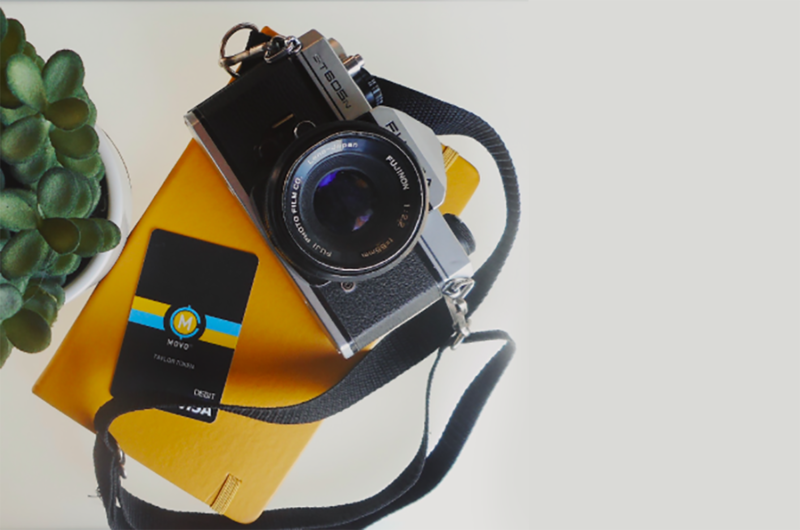 Plus, every verified customer receives a new vertical MOVO card to put into their wallet. There’s one thing you can take to the bank – the new vertical MovoCash card reflects the “Good Vibrations” on the MOVO team. Download the MOVO app today!